"It is not what you say, it is how you say it." I have heard this since I was little. Choosing the right tone of voice can be everything. No matter what needs to be said, it can be said kindly. It can be said with good heart. Except when the words shouldn't be spoken at all. 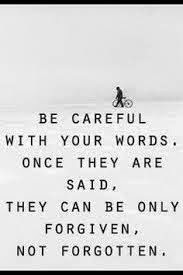 Choosing the right words is every bit as important as saying the right words kindly. When you can't find the right words to say, it doesn't matter how pleasant your voice sounds. When you can't find the right words to say, don't say them.